OK, this is not the usual garden picture or post. But it is certainly related to gardening (at least edible gardening) in the sense that I have been focused recently on simple foods and particularly plant foods. In this vein - and particularly since it's winter - I have been on a hot cereal kick. It seems to me that most breakfast foods, like most other foods we eat, are fairly processed. And while there may or may not be anything inherently wrong with processed foods, I am interested in finding out whether less-processed foods, which are often less expensive and closer to their natural state, can be the building blocks of a diet. So...hot cereal! What I'm liking about hot cereal, as opposed to most of the other items for sale in the breakfast aisle, is that there is just one ingredient in most of the hot cereals I've found. OK, some of them are fortified with vitamins and minerals, but it's not too hard to find one that just contains a cereal grain. My latest discovery is cracked wheat, specifically from Hodgson's Mill. This is the ingredient list: "100% whole wheat, including all the wheat bran and wheat germ"
Nutrition info for 1 serving (1/4 cup): 110 calories, 1 gram (2%) total recommended fat intake (0% saturated fat), no cholesterol, no sodium, 25 grams (8%) carbs, 5 grams (20% fiber), 5 grams of protein, 8% of iron, 10% thiamin, 2% riboflavin, 8% niacin. I should also note that the box contains approximately 13 servings of cereal. I think the price was around $3 or $3.50. Let's say it was $3.50. Even so, that makes a per-breakfast price of 27 cents. Compare that to many of the healthier packaged cereals that you eat with milk. Lots of those cereals and granolas are now going for $5 or $6 per box, and I usually only get 3-4 servings out of those packages. Which means, that the per-breakfast price of those cereals is in the $1.50-$2 range, or 5-7 times more expensive, not including the cost of the milk, which is certainly not cheap either. Of course, any of these options is less expensive than eating breakfast in a restaurant. One of my favorite (fancy) restaurants in town charges $7.50 for a bowl of oatmeal, admittedly enhanced with some fruit. That is of course before tax and tip. Figure altogether around $10 for the oatmeal. And I'm finding that I don't even like oatmeal as much as alternatives like cream of rice, cream of buckwheat and cracked wheat hot cereal. How/why did oatmeal become the most popular and commonly served option?? What does this all have to do with gardening? Well, I would argue that gardeners may cultivate not only plants, but also an appreciation for the beauty of simple things. A perfect tomato, to me, has a beauty that equals the perfect diamond. In fact, the tomato may even be more beautiful, since I can get some direct utility (food) from it. The consumption economy has benefits I suppose (for sellers) but it also compels us to keep working hard so that we can afford the things that we've been told we need to buy. All that work leaves less time for gardening or for enjoy other simple pleasures - a good book, a beautiful sunset. 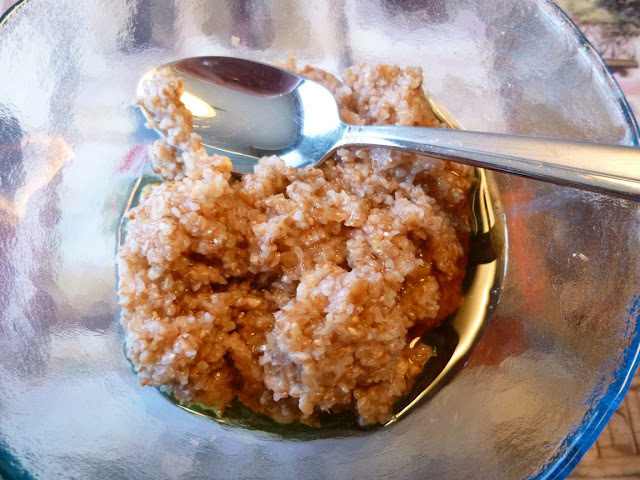 Cracked wheat hot cereal and maple syrup: two ingredients, a beautiful combination for the eyes and the palate. If you can have a healthy breakfast -- and what's more, a nutritious and delicious breakfast -- while saving money in the process, why wouldn't you consider making that part of your daily routine? Also, perhaps it's hard to explain, but I feel there is a certain beauty in simplicity. The more we strip away the extraneous, the closer we get to the essence of things. You can take a flower and tie it up in ribbons and bows, drape sparkly lights and streamers around it, put it in a dazzling vase and fill that vase with shiny pebbles, but sometimes all of that just distracts from the perfection of the flower itself. So I feel it is with simple foods. The gleaming bowl of hot cracked wheat (or cream of rice, or cream of buckwheat...) bathed in the luminous sheen of maple syrup or honey, steam rising through a beam of sunlight -- it is a worthy subject for poetry! And then with simple foods there is also the good feeling with comes from knowing exactly what is in the bowl. Not any complex man-made chemicals. Nothing sprayed on. No artificial anything. Just the goodness of what grew from the earth. And the thought that maybe you too could grow and crack the wheat (with proper know-how and tools). Few of us have the ability to replicate in our homes and gardens all the wizardry of a modern nutritional laboratory, but with simple foods, there is the thought that this is closer to our human roots, something that our own ancestors might have grown and consumed not too long ago. One last thing: I rarely refer directly to the title of this blog ("Garden of Aaron"), but I do think that gardening offers us just a little glimpse of the storied Garden of Eden, a place where the earth is gentle and bounteous. To the extent that we learn to live happily and see the beauty in some of the simple pleasures that are relatively abundant on earth - a cracked kernel of wheat, the boiled sap from a maple tree - I believe we can take a step closer to recovering some of that Eden-like state of being. For these and other reasons, I celebrate the simple diet and hope to share more examples in the days, weeks, months and years to come. Do you have a simple food you enjoy? Please share in the comments section below! Signing up for free email updates is really a simple process. Excellent point about cultivating appreciation for simplicity, Aaron. In many parts of life, including food. Spelt is one of my favorite examples. Thanks for the encouragement, Lee. Spelt sounds interesting. 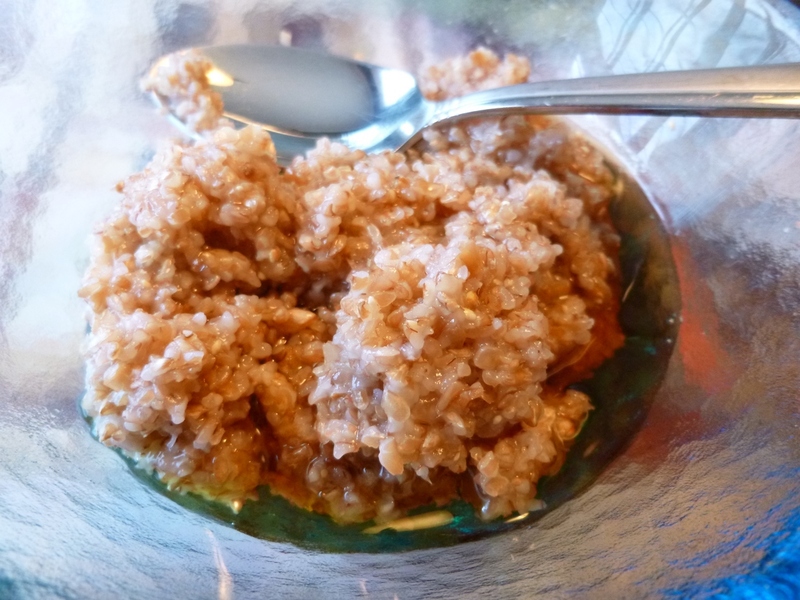 (I found this blog post celebrating it - http://www.thekitchn.com/good-grains-what-is-spelt-49073) How do you prepare it?